Ma'sha'allah, if those words and the imagery doesn't get the message across, I don't know what will! Yikes x1000000! 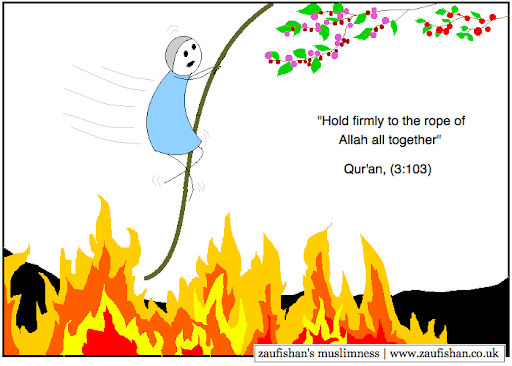 May Allah (swt) Save us all from the Hellfire and Keep us firmly gripping that Rope! Ameen! Again, brilliant comic Sis - artistically, aesthetically, spiritually. Loving them so much. I know you meant this to be a deep and spiritual comic, but I just can't help and picture Tarzan. Aaaaaaeeeeaaaaeeeeaaa.....SLAM! (that's tarzan crashing into the Throne of God, while God gives him look of great annoyance).